All of our 132 sites come with water, sewer, and cable TV. In addition, daily and weekly rates include free electricity! Ideal for Class B and small Class C RV's, maximum length 25 feet. Our largest pull-thru sites offering easy access and beautiful trees. Our largest back-in sites overlooking a pond, putting green and beautiful lawns. Enjoy a private deck shared by these 6 sites, located close to restrooms, showers and meeting rooms. Please choose either 30 or 50 amp electrical hookups. We do not allow adapters. A two-night minimum is required for holidays and special events. We offer a 10% discounted daily rates to members of Good Sam, AARP, TACO, AAA and FMCA. While we try to accommodate guest requests, we are unable to guarantee specific sites. We offer special rates to rally groups, family reunions, weddings, etc. Please contact the office for details. Check-in time is 1:00 pm / Check-out time is 12:00 pm (noon). Any RV 39 feet or more must call the park to make reservations. The office is open every day of the year. 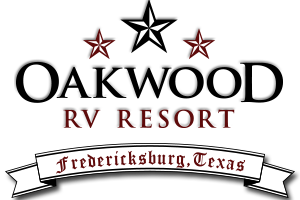 Oakwood RV Resort, RV Park and Campground is located in Fredericksburg, Texas.